Overview - The hot-headed young D'Artagnan joins forces with three rogue Musketeers in this reboot of Alexandre Dumas' story. They must stop the evil Richlieu and face off with Buckingham and the treacherous Milady. Portions of this review also appear in our coverage of 'The Three Musketeers (2011) - 3D'. It's a bit of an odd experience to be constantly bombarded by lavish visuals, stirring score, elaborate action, and nonstop flash, only to come away feeling absolutely nothing in the process, but that's exactly what director Paul W.S. Anderson manages to pull off with his showy yet utterly hollow take on 'The Three Musketeers.' By sprucing up the classic tale with modern action sensibilities, Anderson offers some outwardly pleasing thrills, but completely fails to engage on any kind of emotional level. With characters completely devoid of development and a plot that really only exists as a road map to each new action scene, the film presents a marginally entertaining but ultimately vacuous experience. Based on Alexandre Dumas' classic novel, the movie follows the swashbuckling exploits of three 17th century heroes, Athos (Matthew Macfadyen), Porthos (Ray Stevenson), and Aramis (Luke Evans) as they strive to protect France from duplicitous threats. 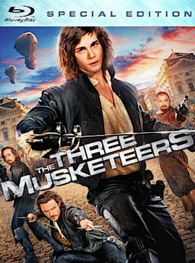 After leaving home in search of adventure, the young D'Artagnan (Logan Lerman) ends up joining the legendary trio of musketeers, and together they attempt to thwart the sinister plans of the Duke of Buckingham (Orlando Bloom) and the beautiful but deadly Milady de Winter (Milla Jovovich). As the conspiracy against the crown grows deeper and more nefarious, the valiant foursome must face seemingly insurmountable odds with the very fate of their country hanging in the balance. Having already been adapted to the screen countless times over the years, in order to make this version stand out, Anderson and his writers attempt to inject some modern sensibilities into the proceedings. Unfortunately, their efforts mostly fall flat, and though there are a few original aspects to their approach, they're all disappointingly superficial, favoring stylistic bravado over competent storytelling and fleshed out characters. The director brings a lot of cinematic flash, injecting the numerous action scenes with contemporary flourishes. Dramatic angles, quick cuts, and lots of slow motion pervade the picture. All of the choreography and stunt work are given a very modern twist, evoking a plethora of recent, post 'Matrix' action, suspense, and heist films. Hell, there's even a 17th century version of a laser beam break-in scenario, which sees Jovovich's character finagle her way through sharp wires. In a rather drastic and seemingly random departure from the novel, Anderson also throws in massive, floating airships, elevating the film's already inflated sense of spectacle, resulting in some fun but decidedly dumb set pieces. While all of the movie's elaborate stunts and fight sequences are admittedly entertaining and sometimes even exciting, the director's gaudy visual techniques are extremely shallow, dressing up mundane events and by-the-numbers plotting with meaningless camera movements and empty stylistic trickery. Fun action can only take a film so far, and unfortunately the script is lacking on all levels. The characters are essentially cardboard cutouts with basic, stock personalities and overly simplistic arcs. None of the musketeers are given much in the way of development. They slash their swords, offer an occasional quippy line and… well, not much else. Athos gets some semblance of a subplot, focusing on his doomed relationship with de Winter, but Aramis and Porthos are essentially nonentities. In fact, the musketeers themselves disappear for a sizable chunk of the running time, with the story instead switching gears toward Cardinal Richelieu (Christoph Watlz) and his silly attempts to manipulate the King (Freddie Fox) and Queen (Juno Temple). For all of its shadowy political intrigue, the plot itself is actually paper thin and the movie's attempts at sweeping romance are laughable. Given the mediocre material they had to work with, the majority of the cast is decent. Under different circumstances I could easily see Macfayden, Stevenson and Evans as great choices for their roles, it's just a shame that the writers fail to give them anything interesting to do. Jovovich is fun to watch, especially in her numerous action scenes, but Christoph Waltz is completely wasted. Orlando Bloom is surprisingly amusing as the smarmy Duke and I have to give the actor credit for playing against type. Poor James Corden has the unenviable task of serving as the film's comic relief, and the various eye-rolling lines he has to deliver are quite embarrassing. This brings us to Logan Lerman who is essentially the story's main protagonist. I haven't seen the young actor in anything else, but here he is pretty dreadful. As D'Artagnan, Lerman seems incredibly out of place and while he handles the stunt work well, his performance is extremely one-note and his attempts at emoting can be downright painful to watch. Coupled with the awful writing, his pedestrian acting makes it impossible to care about the character, and therefore by extension the movie itself. Paul W.S. Anderson's 'The Three Musketeers' is an attempt at mass market, popcorn entertainment. The director intentionally throws logic out the window in favor of pure spectacle, engendering a cartoon-like atmosphere of simple heroics, basic clichés, and bombastic action. While I can appreciate certain aspects of this approach, the end results are far too unoriginal and lifeless to sustain any kind of emotional connection or interest. The lavish production design is actually quite impressive, but any momentary bursts of imagination are sadly wasted on a disposable script that fails to do anything even remotely clever or memorable. The action scenes offer some isolated thrills but there is absolutely nothing of substance to latch onto, and the film's lead remains wholly unconvincing throughout. It's a visually pretty but exceedingly empty affair, resulting in a sporadically amusing but totally forgettable experience. Summit brings 'The Three Musketeers' to Blu-ray on a single BD-50 disc housed in a keepcase with a cardboard slipcover. This disc contains the 2D version of the film only. The 3D version is available in a separate release. After some skippable logos, warnings and trailers the disc transitions to a navigation menu. The packaging indicates that the release is region A compatible. The movie is provided with a 1080p/AVC MPEG-4 transfer in the 2.35:1 aspect ratio. Featuring truly mesmerizing sets, impressive locations, and an absolutely blinding palette of rich colors, 'The Three Musketeers' looks quite stunning on Blu-ray. The digital source is absolutely pristine, offering a clean, noise free presentation. Clarity is remarkable, allowing the viewer to make out every intricate pattern and texture on all of the film's lavish costumes and sets. Various castles, courtyards, towns and landscapes absolutely sparkle with opulent, sharp detail. Colors are almost impossibly vivid, washing the frame with powerful hues. Blues, reds, greens, and purples pop from the screen with gorgeous intensity. With that said, the colors are so bright and forceful that some might actually be turned off by the cartoon-like, unreal saturation. Contrast is high with strong whites and deep blacks. Though this is the 2D version of the film, it is clear that the image was shot with 3D in mind, giving the picture a strong sense of depth and dimension throughout. Bright, colorful, sharp and technically flawless, this is a beautiful looking movie. While the artistry behind the actual cinematography is mostly superficial, and the exaggerated saturation might turn off some viewers, by and large this is an immaculate, reference quality transfer. The film is provided with an English DTS-HD Master Audio 5.1 track along with a Spanish Dolby Digital 5.1 track. Subtitle options include English SDH and Spanish. Exciting and immersive, this is a great, bombastic track. Speech remains clean and crisp throughout, maintaining nice balance with the score and effects work. Surround use is very strong, filling the room with appropriate ambiance, giving the film's various settings pleasing auditory life. Directionality and imaging are all great, and the movie's various action scenes are quite enveloping. Slashing blades, flying arrows, musket fire, and explosions all come through with piercing fidelity and room shaking bass. Dynamic range is wide, providing an immense gamut of distortion free frequencies. The only minor drawback to the audio is that the track sometimes lacks finesse. The set pieces are wonderfully aggressive, but the mix's quieter moments don't offer the same level of subtlety and auditory nuance as other superior efforts. 'The Three Musketeers' sounds fantastic with an enveloping, thrilling mix. The action scenes feature a powerful kick, and while some of the design choices could use a bit more refinement, audiophiles should find little to complain about here. Summit has compiled a solid assortment of special features including a Blu-ray exclusive interactive experience. All of the extras are presented in 1080p with Dolby Digital 2.0 audio and the same subtitle options as the main film. Audio Commentary with Filmmakers - Director Paul W.S. Anderson is joined by producers Jeremy Bolt and Robert Kulzer. This is a pretty standard track with a basic assortment of production information and trivia littered throughout. Details on casting, locations, sets, stunts, and Anderson's preference for practical effects are all discussed. Changes and "enhancements" from the book are also touched upon and the director offers some insights into the 3D filming process. There's nothing particularly revealing about the conversation and lots of the information shared here is expanded upon in the much more interesting Access mode, so fans are probably better off just watching that. Featurettes (HD, 10 min) - Four brief featurettes detailing various aspects of the production are provided, viewable separately or together. Topics focused on include Anderson's take on the material, the casting of Orlando Bloom, the sets & visual effects, and the filming locations. While there are some decent insights offered, all of this material is repeated from the disc's Access mode, making their inclusion here a bit superfluous. Deleted & Extended Scenes (HD, 14 min) - Twelve deleted and extended sequences are viewable together or separately. These are really nothing more than very minor, useless extensions that add more groan inducing moments of comic relief. The most notable sequence involves a longer version of the final duel, but even that isn't terribly exciting. It should also be noted that the packaging indicates the inclusion of filmmakers' commentary on these scenes, but this is not actually the case. Paul W.S. Anderson's 'The Three Musketeers' is a mindless, simplistic, and utterly disposable take on the classic novel. While the production design is top notch, all of the talented crew's hard work ends up wasted on a superficial script with paper thin characterizations. There is a marginal amount of fun to be had with the action scenes, but they can't save an otherwise thoroughly mediocre effort. On the plus side, the disc's video transfer is reference quality and the audio is excellent. The Access mode supplement offers a wealth of interesting material, but the rest of the extras are a bit redundant. Overall, this is a rental at best.